SANTEE (07/19/2014) For the sixth straight game, the San Diego Surge (11-0) didn't allow any points in the second half as they rolled over the visiting Kansas City Titans (10-1) to move on to the WFA National Championship, where they'll face the Boston Militia (10-0) on Saturday, August 2nd. This will be the team's third national championship appearance in their four-year history. It will also be a rematch from the 2011 championship game where Boston came away with a 34-19 victory. "You couldn't write a better story," said Surge head coach William Harris. "It's a grudge match." The Militia are coming off a 63-14 rout over the defending national champion Chicago Force in the National Conference title game. 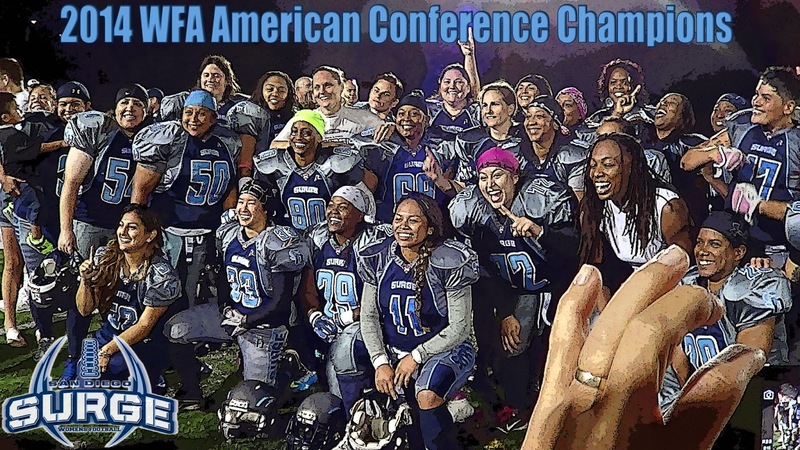 "This is what women's football need, a slugfest in the championship game. So it should be fun," Harris added. The Surge got off to a hot start in the first half leading 19-0 in the second quarter before Kansas City got on the board with a 54-yard touchdown pass. The Titans would score another second quarter touchdown before the Surge put up 40 unanswered points to pull away for good.